I’m suddenly obsessed with lavender. Maybe it’s because Adrienne and I are featuring pastels for June’s “How I Wear My” or maybe it’s because I passed by Bergdorf Goodman the other day when I was on the bus with my son and just the site of the store makes me think of lavender, their signature color. Maybe it’s the lilacs in bloom? The Japanese wisteria? Whatever it is, I’m crazy for lavender right now. 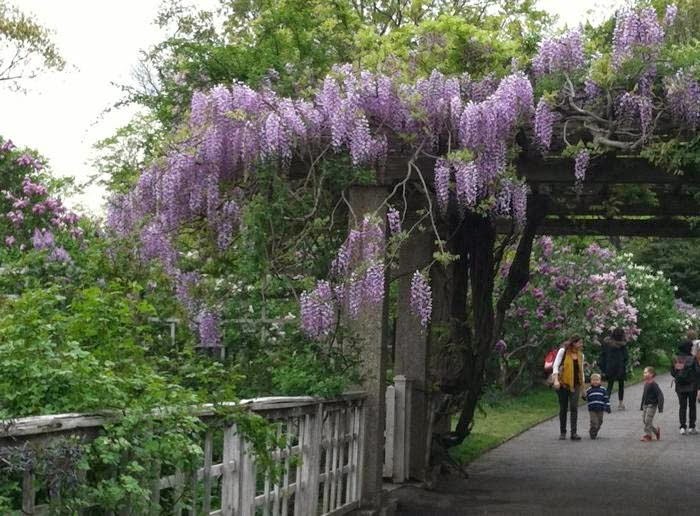 The glorious Japanese Wisteria at Brooklyn Botanic Garden. Photo by Jeanne Rostaing. A gorgeous cotton lace trench by Burberry. $2,495. Ouchy ouch ouch! 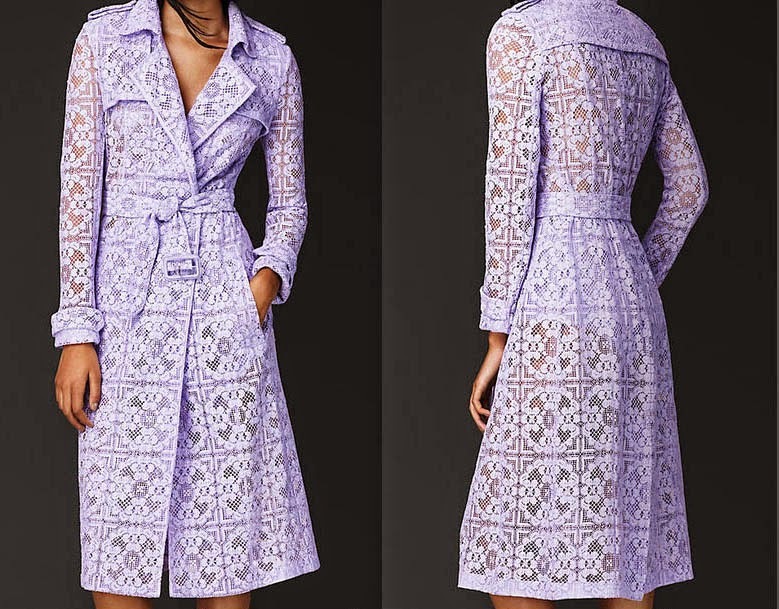 I am especially wild for this Burberry lace trench, it is just so beautiful, but at $2,495 that’s not happening so I pulled out the Essie nail polish in Lilacism I bought last year. 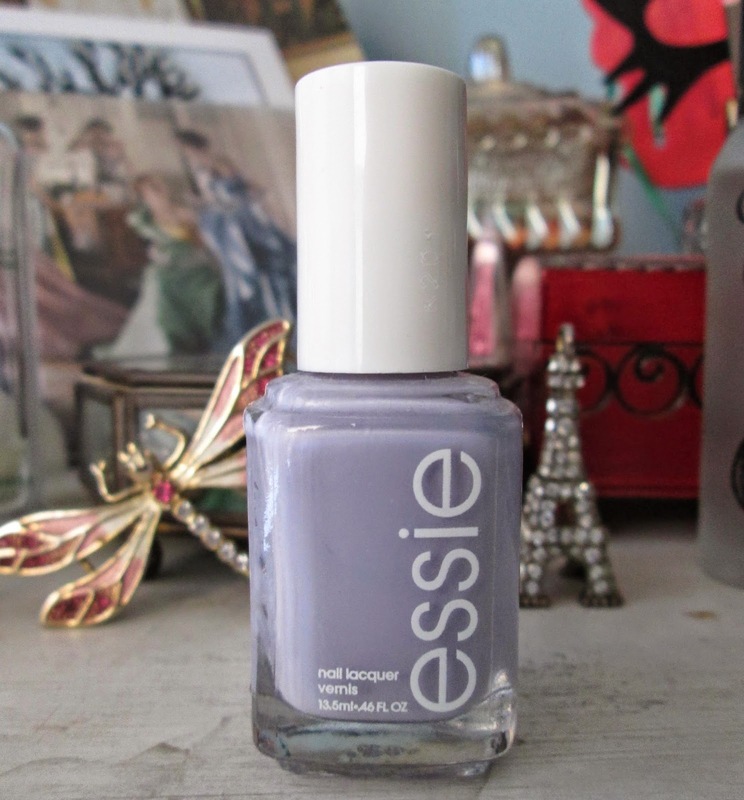 It’s a lovely creamy lavender with no shimmer and looks especially pretty as a pedicure color. I just saw it at CVS the other day so it should still be available where you are too! I also picked up on eBay a used copy of Scatter My Ashes at Bergdorf Goodman for the very nice price of $10.07 and free shipping, whee! It was published in 2012 in conjunction with the documentary of the same name (which I should review, I saw it in theaters last year) and covers the history of the store. I do love a grand department store and I tell you, Bergdorf is the best of the best. I can’t imagine loving another store more. A lovely book about the history of my favorite department store! As for lavender, I find it such a calming and luxurious shade and I love how it pairs so well with black, gray, white, and every shade of blue. Are you a fan of lavender too? I love lavender and that soft shade of mauve is lovely. Spending that much money really is only for the extremely rich as the rest of us could enjoy a week in Paris for that amount! I agree it is a beautiful colour. Love the wisteria. Ours seems to be fading from its short lived glory. That lace coat is exquisite but it certainly would pay for a lovely getaway experience. Lavender is one of my favourite springtime colours. Gosh, that lace coat is incredible! There is a lavender festival across the street from us every summer...I am planning on going this year if for nothing else than to see the fields. So gorgeous! I am looking forward to June's HIWM Pastel. I don't have much of it for some reason but enough to pull together a look or two. Too bad I don't have that fab lace coat! That lace trench is stunning! That alone would have me loving lavender...it is one of my favorite scents. Beautiful. Such lovely lilacs. I'm one of a small minority that just finds the aroma of lavender annoying. But the color is a fave. It's beautiful in lace, as you show. So pretty! I love all the pretty icy pastels out right now, but they're hard for me to wear. They just wash me out. WAH! But I will still wear them as accents. I had a hard time with this months HIWM, but I will be getting a pic in soon. That lace trench is amazing. I'm putting that book on my reading list. Thanks for the suggestion. That Burberry trench is beautiful, wow. I love light lilac, it was the color of my bedroom as a child. I also love the scent of lilacs and lavender. I love lavender, all pastels really. I also pair it with a soft brown as well as the colors you mentioned. that wisteria is beautiful! !